As I mentioned, there are a lot to rivers. You can simply draw a squiggly line from point A to point B and call it a day, but if you really want to understand the how and why of a river, especially if you are seeking an accurate story, then we need to go into finer detail of rivers. In reading this, you may ask why do we need to go into so much detail about rivers. Often times in narrative, rivers are treated as water inside a ditch. It’s more complicated that that. In knowing how rivers work, may change elements of your story. Much of what gives rivers its shape is erosion. A river is constantly eating away on the land, which over time causes the river to change shape. What also gives rivers it shape is flow of water. Is it a steady flow or irregular? Does it ever flood? This is important to know, especially in determining the shape to a river and its age. How do we determine age of a river? First, we must remember that any part of a river can be older than any other part, even if it is in the middle. With rivers changing over time, sometimes a river form a new path or remember an old path and that changes the age of that section. In the next tutorial, we’ll go over more about the shape as we discuss alluvial, bedrock, meander and braided rivers. For now, we need to understand sediment. Sediment is basically minerals that is eroded off mountains, rocks, land, or is volcanic ash. It enters the stream and flows down. Sediment comes in a variety of sizes from fine grain sand, to coarse sand/rocks, to boulders. Now depending on the river, sediment can form on the bed of a river. However, sediment can also be used in another way that proves to be helpful to the environment. Flooding. When a new river has too much water than it can handle, say like monsoon or glacial run-off, it will essentially overflow in all directions. This will go onto the land. When this happens, there is a transfer of sediment onto the land. Over time, this forms two different types geological features. Levees and Floodplains. Another term for Levees are dykes. Both are essentially areas next to a river going towards the land. This is know as the Riparian Zone. Levees tend to have heavier and larger sediments than the floodplain. This is due to their size and/or weight and how far the flood waters can transport them. Over time, this create a hump between the river and the floodplain. This can act and a river bank, though so can sand point bars, which are basically beaches for lakes. Beyond that is floodplains. Floodplains tend to have finer grain, essentially sand. Since it is smaller, it can travel a lot farther. As this builds up over time, it will do two things. First off, it will promote the growth of life. Many minerals that rivers can carry through sediment, including organic material and silt, can help plant life grow. The second thing floodplains can do is absorb water when the river is flooding. With there also being plants and trees on floodplains, both can help reduce floods from reaching the land or reduce the damage. So why then are people affected by floods? Often times humans build on floodplains. Namely for it’s rich soil and it’s ease of access to a river. Doing this destroys the ecology of the Riparian zone, and makes flooding much worse for local populations. Pre-Modern civilizations won’t know their destroying floodplains is causing bad floods for them, and likely believe a supernatural explanation. In our next tutorial, we’ll discuss how erosion and floodplains create the different kinds of rivers and the shapes that we should expect to see. 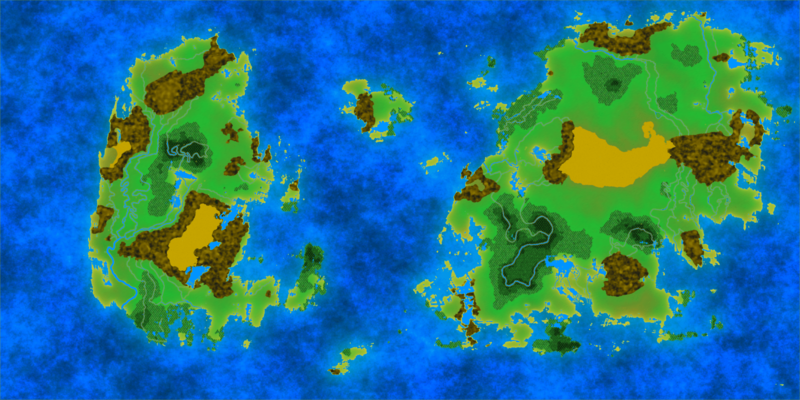 I didn’t have a map ready for the first part of rivers, but if you look back there now, you will see my rivers. If you look, you will notice I have a lot of rivers, but you will learn in the next tutorial that I didn’t hand drawn all of those. One thing you will notice is that many of my rivers go through forests. As far as doing that, you can follow the tutorial on drawing them, using the river placement layer. Personally, I map my rivers according to black forest areas, as in my world, there is a reason there are so many large trees there spaced together. There is an abundance of water. When making a river in a forest, I set the brush 1 level thicker when I go from light forest to black forest. For your map, this is not something you need to do. However, this can be used to help determine where the most fertile land is located and where beaches are located for the river. Not all areas of a river will have floodplains, only parts of the river that flood. You can later determine where that is if you want to delete part of this. Also, you will notice we have a lot of layers by this point. Before starting this section, I myself have 31 layers. Might seem excessive, but part of doing this, I accidentally messed up my forests and saved it. I had to go back and redo all my forests and that was not fun. All the layers are necessary. Don’t worry if your number doesn’t match mine. I do a lot of extra things. e. Set the tool to width of 1 or 2. I chose 2.
f. Uncheck both boxes on bottom; then press OK.
c. Set Transparency – Alpha in Color box between 50 – 150. I set mine to 100. 3. For all your other river layers, do the same exact steps. d. Do that for each layer that has a FP layer below it. When you reach the bottom, you are done. You’ll note that there are floodplains in the forests. While there can be floodplains in a forest, they are generally covered up by by the forests. We are free to remove them if you wish. We’ll deal with rivers in forests in the next lesson. If you want to make you floodplains bigger, then start with your lowest river level with a width of 1-2, then the next level be 2 – 3, and then the next be 3 – 4 and move up from there. Shouldn’t need to go beyond 6 though. You Know You Are a Writer When… you keep writing right on through all of life’s distractions.